Whatever you need to improve the look and condition of your natural stone floor, Infinity Floor Restoration has the perfect solution. Our expert technicians can confidently tackle any problems with your Terrazzo, Marble, Travertine, Limestone, Concrete or Granite flooring, as well as offering top quality Tile & Grout cleaning, sealing, and maintenance services, and leave your space looking fresh, clean, and brand new. We focus on putting clients at the heart of our business and specialise in providing high-quality service and results that leave you satisfied. Rest assured that your natural stone flooring is safely in the hands of professionals. Natural stone is a popular choice in both commercial and residential settings. It offers a clean, elegant, and sophisticated finish to any space, and its resilience means that it is popular in areas which will encounter a lot of physical pressure, wear and tear, such as flooring. Natural stone cleaning, polishing and restoration can make all the difference to shine of your natural stone floors. There are different types of natural stone, each with their own benefits and suitability for different uses. Marble, Granite, Limestone, Terrazzo, Travertine, and Slate are all great examples of natural stone. Natural stone floors are often found in many hotel lobbies, office blocks, apartments and homes. 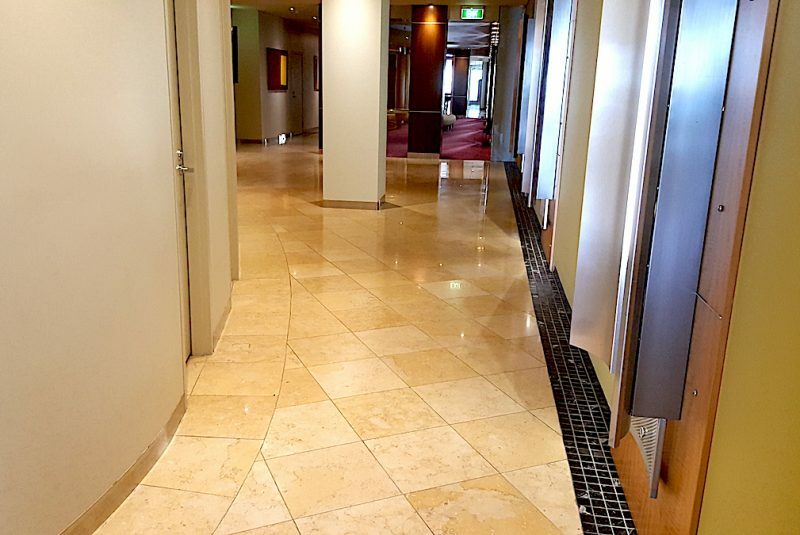 If you care for marble flooring, travertine office floors, a terrazzo bathroom suite, or even a granite benchtop, you may need Infinity Floor natural stone restoration services, for cleaning, grinding, honing, polishing and sealing. Due in part to its natural composition, natural stone can be tricky to work with, as different types require different types of natural stone repairs and or restoration. For example, travertine floors will contain naturally-occurring holes which must be managed to balance safety with the natural design. Granite polished benchtops might be a stunning visual addition, but may require the expertise of a specialist natural stone repair and restoration service provider, such as Infinity Floor restoration services. Marble polishing works on a softer stone, more prone to scratches and other marks, and so requires different treatment again, while terrazzo polishing adds a sheen to the natural stone. The versatility of natural stone is one of its key qualities, but it also means you need the assistance of a natural stone restoration, repair and polishing service to ensure it looks its best. Why does Natural Stone require maintenance or restoration? Though natural stone is durable, it also has some vulnerabilities which require maintenance, care or even repairs. Natural stone polishing and restoration helps to keep the surface looking its very best. This is particularly true of natural stone flooring, which endures the daily pressure of hundreds of feet wearing away the surface, as well as dirt, grit, and the other unpleasantness which comes with the underside of shoes. Over time, these will dull the natural stone, wearing away the natural shine and introducing scratches and other anomalies which can ruin the look of a smooth, polished finish. As a result, specialised deep cleaning is required in the first instance, to ensure that the surface is fresh and clean before being sealed or polished. Though natural stone cleaning is essential for maintaining quality, regular day-to-day cleaning can actually be detrimental to some natural stones, as it causes scratches and marks from improper care. In addition, some marble polish, granite polish or other commercial polishers can lead to discolouration and warping with certain materials – particularly limestone – spoiling the appearance of your floor. To make the most of these beautiful materials, it is important to invest in a reputable natural stone restoration and repair company such as Infinity Flooring. We will ensure with a regular natural stone maintenance program, your floors, benchtops and splashbacks will always be looking at their best for many years to come. Sealing the surface offers a protective barrier between the natural stone and its environment, which can help to prevent some of these issues. This allows easier cleaning over the treated surface; sweeping and mopping becomes easier and more effective, as you are not fighting against ingrained grime and dirt. The surface can then also be polished, restoring its former glory and allowing it to look its very best, free from stains or damage. This regular maintenance can prolong the longevity of your natural stone, giving it a new lease on life at your convenience, as well as improving the appearance and instantly adding a fresh new feel to the space. Regular and thorough cleaning is an important part of maintenance for your natural stone surface, but sometimes it is not enough on its own. If there are ingrained marks, scratches, and grit, you may find it difficult to get your natural stone floor looking completely fresh with simple cleaning alone. This is where natural stone restoration can come in. The process first requires all grout to be removed and replaced, allowing the grout to come flush with the top of the tiles, resulting in a more natural and thorough finish. The next stage involves honing and grinding the top layer of the natural stone using diamond-impregnated pads equipped on wet polishing machines. The surface is then ground, moving up through a number of grits to remove lippage before a final polish is applied to eliminate any final nicks. The entire floor is then thoroughly polished to bring out and enhance the natural shine of the stone, resulting in a smooth, flawless finish. This process allows small scratches and marks to be buffed out, leaving you with a natural stone floor which is smooth, shiny, and glossy, with no unattractive marks or defects. This also helps to showcase the natural properties of the stone, resulting in a longer-lasting and more authentic shine. The process also removes noticeable grout lines, allowing the natural stone to sit more evenly and present a uniform, sleek finish. It is important to implement an effective and regular cleaning routine in order to maintain the finish and increase the longevity of your natural stone floor. At Infinity Flooring, we pride ourselves on our excellent standards, and our products are no exception. We specialise in using DryTreat, an industry-leading sealer which guarantees exceptional results. It offers long-term protection against a range of issues such as spills, chemicals, and dirt, and acts as a barrier to resist stains and prevent them from embedding. The natural colour and tone of the stone is also maintained and preserved, allowing you to make the most of the natural features of the material. It works by penetrating deep into the material to provide comprehensive protection and also has the added bonus of being suitable for any weather, maintaining its strength even in the rain, and is resistant to high-pressure washing. This allows you to treat indoor and outdoor spaces with the same high-quality product and keep the area clean and maintained following the sealing process. Regular natural stone maintenance is an essential part of keeping your flooring looking its very best, and preserving its vitality and durability whilst also extending its life. Poorly-maintained and neglected natural stone will begin to chip and crack, giving it a scratched, marked, and dull appearance. By taking the time to a natiral stone maintenance plan inc. cleaning, sealing, and polishing, you are helping to improve the durability of your natural stone, instantly improving its quality and appearance. Allow your floor to show off its full potential, creating a clean, fresh, and appealing space for everyone.